ALL ALLERGY AND ASTHMA CARE | What is a Pollen Allergy? Pollen is one of the most common triggers of seasonal allergies. Many people know pollen allergy as “hay fever.” Experts usually refer to pollen allergy as “seasonal allergic rhinitis”. Plants release tiny pollen grains to fertilize other plants of the same species in the spring, summer and fall. 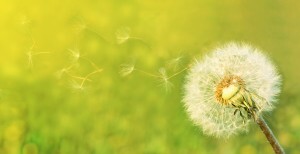 Most of the pollens that cause allergic reactions come from trees, weeds and grasses. These plants make small, light and dry pollen grains that are transported by the wind. In early springtime, trees are the predominant cause of pollen allergy. Certain species of trees, including birch, cedar and oak produce highly allergenic pollen. A bit later in the year, grasses are the most common cause of allergy. Ragweed is a main cause of weed allergies, and builds up later in the summer. Other common sources of weed pollen include sagebrush, pigweed, lamb’s quarters and tumbleweed. Plants fertilized by insects, like roses and some flowering trees, like cherry and pear trees, usually do not cause allergic rhinitis.